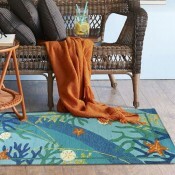 Rugs For Your Indoor and Outdoor Spaces! Rugs can play a special role in bringing the room décor together. For your living room, you want to use an area rug large enough to anchor all the central living room furniture pieces together. Smaller, area rugs may work for tiny rooms, apartment or condominium spaces, but be careful not to go too small. The proportion can impact the perspective size of your room. Which comes first? Rug color or furniture color? It’s a general good rule of thumb to consider purchasing your furniture first then add your rug. Your upholstery should make the primary statement and your rug should simply blend everything together. Our accent and area rugs include a wide variety of brightly colored floral and patterned designs. 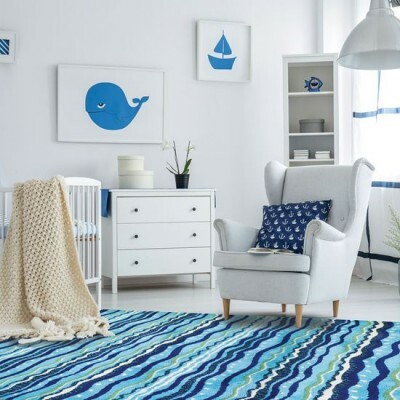 Our coastal rugs include designs that have a more nautical, beach or coastal color palette. 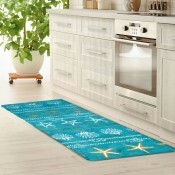 Accent rugs are typically used for entry ways and bathrooms. All our accent and area rugs can be ordered in varied sizes to meet your specific design needs.